The Salerno Amalfi ferry route connects Italy with Italy and is currently operated by 2 ferry companies. 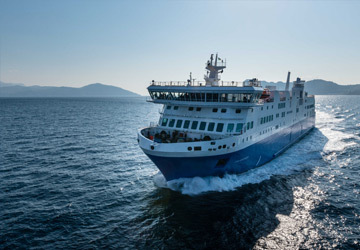 The NLG service runs up to 7 times per week with a sailing duration of around 40 minutes while the Travelmar service runs up to 11 times per day with a duration from 35 min. So that’s a combined 12 sailings on offer per day on the Salerno Amalfi route between Italy and Italy. Compare now and get the best fare at the time that you want to travel. The Italian city of Salerno is located on the Gulf of Salerno on the Tyrrhenian Sea, and is the capital of the Salerno region of Italy, and is close to the Amalfi Coast. The town is well known as the home of the first medical school in the world, the Schola Medica Salernitana. The city, which is the cultural hub of the region is popular with visitors who enjoy strolling around the city taking in the wonderful sights, many of which are located close to the city centre. The city is characterised by beautiful pedestrian street, large piazzas and lovely shops. The city is located in the centre of a geographical triangle nicknamed the Tourist Triangle of the 3 P's, whose corners take in the towns of Pompeii, Paestum and Positano. Because of this there are many points of interest including the Lungomare Trieste (Trieste Seafront Promenade), the Castello di Arechi (Arechi's Castle), the Duomo (the Cathedral) and the Museo Didattico della Scuola Medica Salernitana (the Educational Museum of the Salernitan Medical School). The Italian town of Amalfi is the largest town located along the Amalfi Coast which is in the Province of Solerno. The town lies on the shores of the Gulf of Solerno and at the base of Monte Cerreto. Along with many other towns along the Amalfi Coast such as Ravello and Positano, Amalfi has been declared a UNESCO World Heritage Site. The town's written history dates back to the 6th century AD and soon after became an important maritime power by trading grain from its neighbours, slaves from the interior, salt from Sardinia and timber, in exchange for gold dinars minted in Egypt and Syria. This trade was carried out in order to purchase Byzantine silks that it then sold on to the West. The town is used to looking after its visitors with several former monasteries having being converted into hotels. The Luna Convento was converted in the beginning of the 19th century and the Cappuccini Convento was converted in the 1880's. Celebrated visitors to Amalfi included the composer Richard Wagner and the playwright Henrik Ibsen, who both completed works whilst staying in Amalfi. Seasonal hydrofoil routes connect the resorts on the Sorrentine and Amalfi coasts as well as Pozzuoli, Ischia, Procida, Naples, Torre Annunziata (for Pompeii), Ercolano (for Herculaneum), Capri, Salerno, Agropoli (for Paestum) and Palinuro on the Cilento Coast.